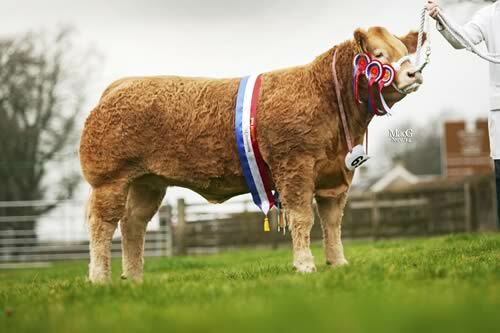 Charolais sired cattle dominated the winning lines and secured the silverware at LiveScot, the Scottish National Fat Stock Club’s new winter event staged at Lawrie and Symington’s Lanark Agricultural Centre on Saturday November 29 2014. The champion of champions title went to the supreme heifer, Candy Floss, a 12 month old Charolais cross by Billingley Siralex and tipping the scales at 604kg. She later went on to lead the trade at £3,000 to Chris Pennie, Llandyssil, Montgomery. Candy Floss was bred and exhibited by Dermot and Gareth Small, Kilkeel, County Down who for 20 years have been making the trip over the water to Scottish club’s annual event before finally securing the silverware. “Dreams have come true; we’re on cloud nine,” said Dermot. The reserve overall and steer championships went to Golden Charm, a year old Carradale Neptune son and weighing in at 626kg. Bred by David Henderson, Auchenrivoch, Banton, Charm was bought by Sheena Kennedy, Overton, Ayr in Caledonian Marts in September and turned out by son, Sean. Charm later sold for £1,900, to butcher H Cairns, Uddingston, Glasgow.